Specifications: Oasis Model PGV8AC shall be for Green Specified construction, deliver 8.0 gph of 50° F degree water at 90° F ambient and 80° F inlet water. Shall include a single vandal resistant push button to activate the flow of water. Basin shall be designed to eliminate splashing and standing water. 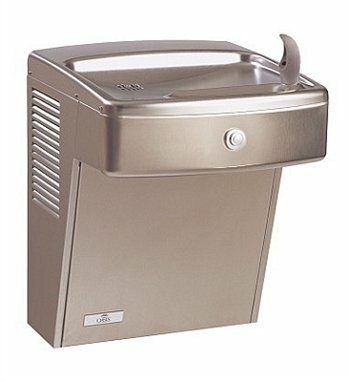 Bubbler shall have a flexible guard, vandal resistant, and operate between 20 and 120 PSI. Cabinet finish shall be brushed stainless steel. Cabinet shall have perforated galvanized steel screens to prevent objects from being inserted into the cooler. Cooling system shall use R-134a refrigerant. Shall comply with ANSI A117.1 and ADA. Shall comply with ANSI A117.1 and ADA. Shall be listed by Underwriters' Laboratories to U.S. and Canadian standards. Shall comply with ANSI/NSF 61. Standard Features: Built-in 100 micron strainer stops particles before they enter the waterway. Waterways are lead-free in materials & construction. Brushed Stainless Steel Finish. Stainless Steel Top. Vandal Resistant Bubbler With Flexible Guard. Galvanized Steel Louver and Bottom Screen. Heavy Duty galvanized steel frame. New High Efficiency cooling system. Refrigerant R-134a. Product Certified to NSF/ANSI Standard 61, Annex G (AB1953). Vandal Resistant Front Push Button. Vandal Resistant Fasteners. Built-in 100 micron strainer stops particles before they enter the waterway. Waterways are lead-free in materials & construction. Brushed Stainless Steel Finish. Stainless Steel Top. Vandal Resistant Bubbler With Flexible Guard. Galvanized Steel Louver and Bottom Screen. Heavy Duty galvanized steel frame. New High Efficiency cooling system. Refrigerant R-134a. Product Certified to NSF/ANSI Standard 61, Annex G (AB1953). Vandal Resistant Front Push Button.